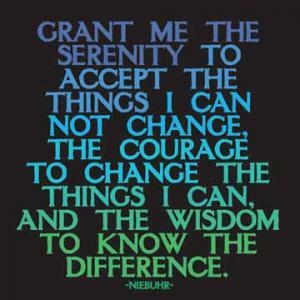 I’m not religious by any stretch of the imagination, but I do believe in the Serenity Prayer. It’s something I have to remind myself of often as I interact with both my kids and my projects. It provides a level of grounding. What’s the point of getting frustrated if it’s outside my control? The nature of my personality requires that I be hands on. I want to be involved. I want to help control the outcome. But the nature of many of my projects results in things outside my control. These projects are big and complex integration projects that involve technical resources both within my organization and often within the client; and business users. Often the decision to move forward with this implementation was handled by resources higher up the corporate food chain. This means there are questions, considerations and discovery that need to take place at the beginning. The inner workings of corporate culture and the organizational power hierarchy become evident here. It is usually at this time when a decision is made that is totally outside your control, but has major impact on the project. It may be a decision to user an external intermediary for some piece, or the implementation of a business process that impacts overall timelines. My initial inclination is to get frustrated. It’s that overwhelming feeling of wondering how you are going to accomplish what you set out to do if you don’t control all the pieces. After a little while, I remind myself that I can’t worry about things outside of my control. These are things that I can’t change. So what can I do? Accept the things I can not change – Most importantly, I can recognize and remind myself that there a components of the project that I do not control, and can not change. This allows me to keep my sanity during the project implementation. Establish Trust – I can establish trust with whomever is involved in the project and do my best to work together towards the overall success of the project. Communicate – I can engage fully with the entire project team and make sure everyone knows the status. There is some trial and error that needs to happen to determine the appropriate level of communication. Raise Concerns & Questions – I can monitor the project situation and raise concerns & questions to the appropriate team members. Focus on what I can control – It’s my job to be looking at the entire picture. What can I contribute? What ideas or actions can I bring to the table to facilitate project implementation success? This approach is one I need to do a better job of also applying to my children. In some ways it easier to apply this to a project and people you are professionally affiliated with rather than your kids. I think the principles are the same. Yes, your kids belong to you. However, they have their own personalities and natural characteristics which combine with their unique nurtured experiences that we need to consider. I need to keep reminding myself of this as I work to establish & maintain trust, openly communicate, raise concerns & questions and focus on what I can control while encouraging them to do the same.